Welcome to Tea Party Tuesday, dear readers. Let me pour you a nice cup of hot tea. Today I'm serving Lemon Lift. I find it refreshing and appropriate for Spring! The photo above is from Hotel Granduca in Houston. 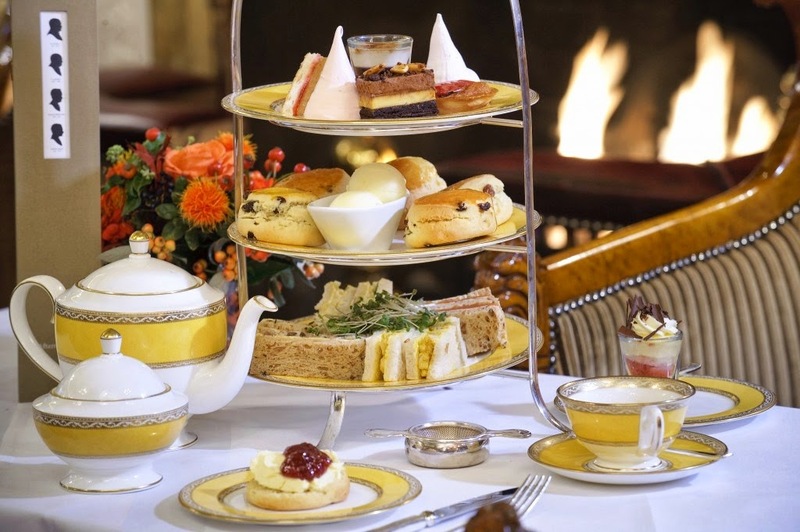 The article I found on their site was about the History of Afternoon Tea and Tea Etiquette 101. I was familiar with the facts but differed on one point. When I visited England, I was told milk was added first, then the tea and sugar. The tradition was based on trying to prevent the cup from cracking. The milk acted as a buffer for the hot tea. Please have a sandwich. I don't care for smoked salmon but the cucumber one looks good. What are your favorites? 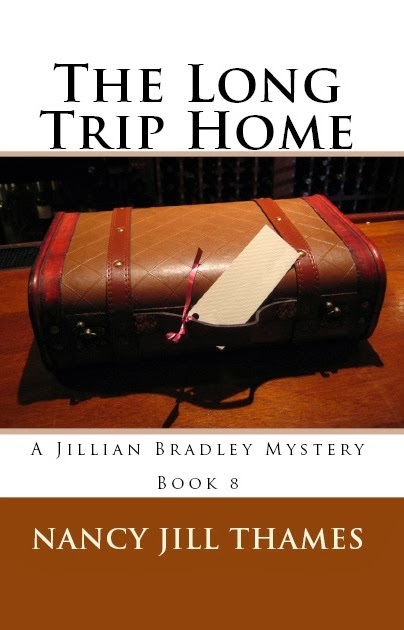 Last week I took a rest from writing the first draft of "The Long Trip Home" but will now start the rewrite, adding more description and detail. This past weekend, my husband and I made a visit to San Antonio to see our daughter and plan the next Jillian Bradley Mystery. Holly helped choose names for the characters, which was a great help. Let's try the scones. I love to spread them with lemon curd and clotted cream, but strawberry jam or orange marmalade are lovely, too. I hope you had a good week. Thanks for joining me today - it was a pleasure to have you. 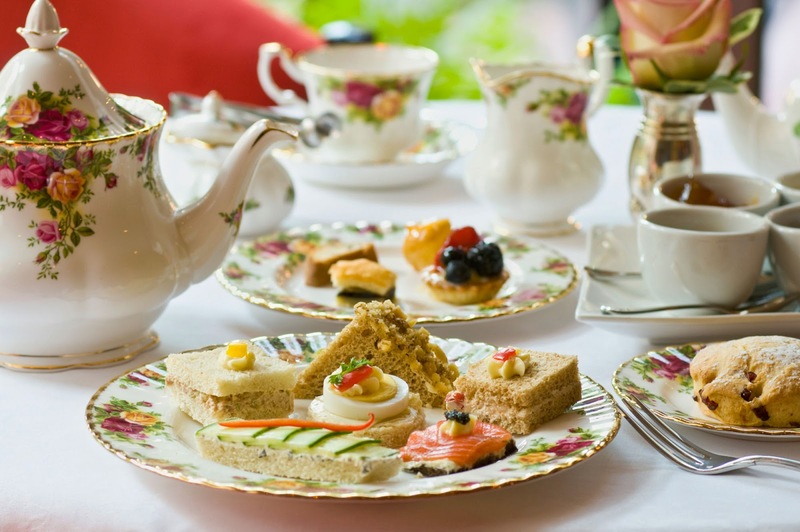 Welcome to afternoon Tea Party Tuesday, dear readers. Please let me pour you a nice hot cup of tea (or coffee if you prefer). The photo is from Travel PR's site celebrating 10,000 Twitter followers. I love the yellow china, don't you? 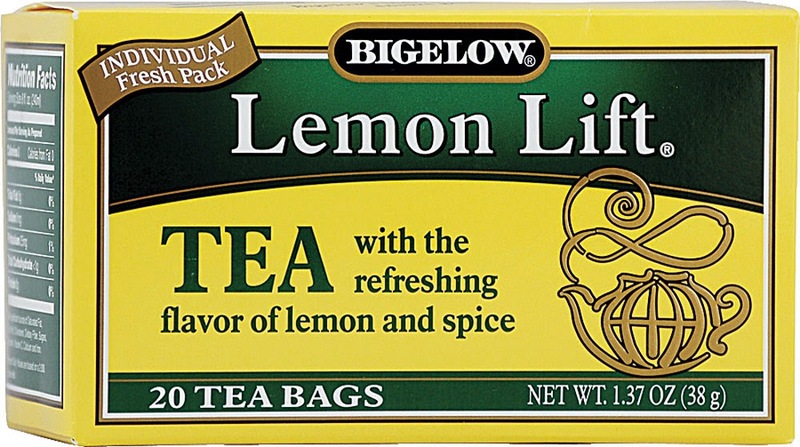 Jasmine tea is one of my favorites, but I also love Lemon Lift, Lady Grey, and English Breakfast. My all time favorite, however, is a combo of Darjeeling and Earl Grey. It reminds me of the tea served in England when my husband and I visited as part of a trip celebrating our 15th anniversary. Yes, please have another sandwich. 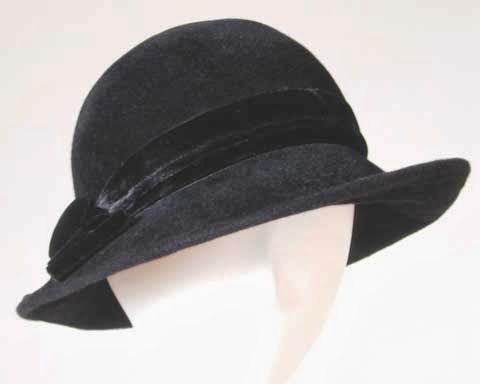 If wore a hat today it would be something like this from Mary Ann Koch Courture Creations. Is it still a tradition a lady doesn't wear Spring hats or white until Easter Sunday? I think it's time for a scone. Are you brave enough like me to wear hats? Where do you wear them? I always wear a sunhat, even if I'm only going to WalMart. And men, if you're like my husband, you may wear a hat so you won't have to comb your hair! Let me refill your tea. To me, the ritual of afternoon tea is a lovely way to share a visit with friends. I'm so glad you that you joined me today. 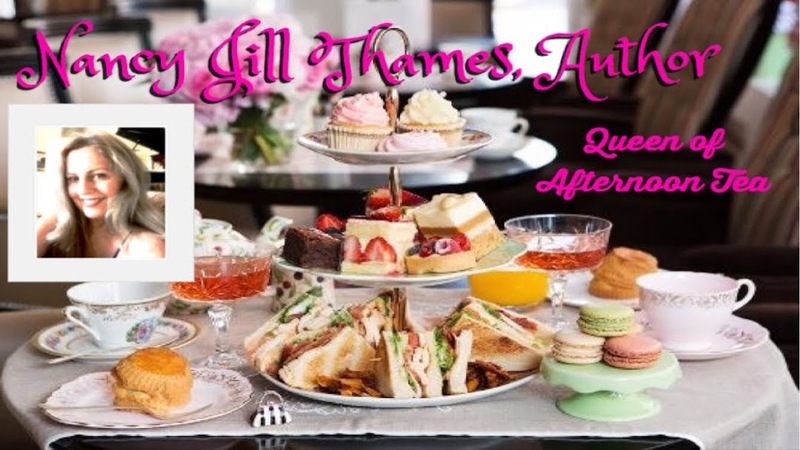 If you'd like more afternoon tea experiences, you may enjoy The Jillian Bradley Mystery Series. The first book is my gift to you as an ebook. Please let me know if you liked Tea Party Tuesday. I'd like to make it a weekly event. Thank you. 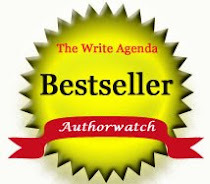 I stepped into the author boat in 2010 and have been rowing hard ever since. This video was made to share at the upcoming Art and Author Fair at the Georgetown Library. If you'll be in the Austin, Texas area on that day, please mark your calendars to attend. I'd love to meet you! I'd really appreciate you sharing this post on Google + and all your social networks. The share buttons are at the end. Thank you! Treat yourself to an afternoon of art, acting, music, wine, and great books. Meet local artists and authors who make the world come alive as we “look in the book”. 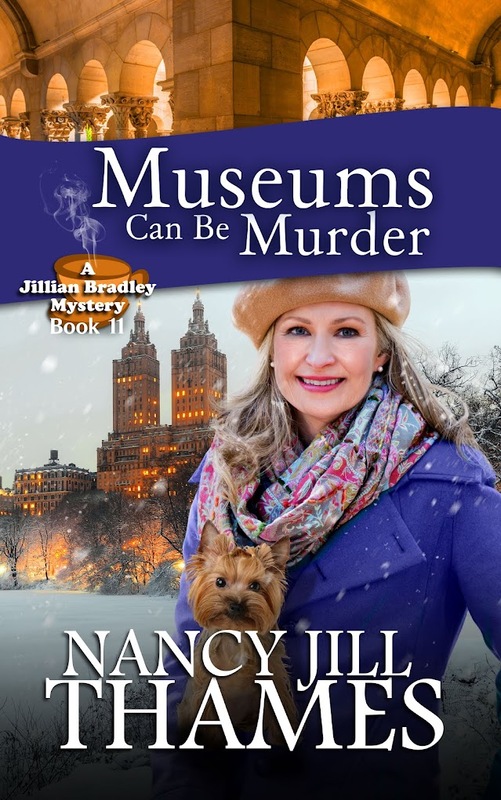 As some of you may have already guessed, many authors use their imagination to come up with characters for their stories like I did with Jillian's companion, Teddy. Here's how it happened. Since living in the Bay Area of California has always been one of the most expensive places to buy a house, we rented for the first twelve years of our daughter's life. Like most children, Holly wanted a dog in the worst way and begged us to get her one. We promised when we bought a house we'd buy her a puppy. The very week we moved into our new home, Holly began her search online for the perfect puppy, and soon found one - a female Maltese in Florida. After two flights, Chloe arrived in Oakland where we picked her up in Cargo at the airport. She pranced out of her crate and into our hearts. But there was a problem - Chloe's food did not arrive with her. She wouldn't eat any dog food we bought, began to lose weigh and grew lethargic. The vet suggested Pedialite to keep our precious puppy hydrated and wished us luck. That night our luck changed when my husband brought home Taco Bell for dinner. Our son, Michael, offered Chloe a bit of cheese from his Cheesy Gordita Crunch, and Chloe ate it. Then he offered her bits of lettuce, meat, and tortilla, and she liked that too and began to perk up. From that day forward, we fed Chloe a diet of ground meat, veggies, fruit and grains which she eats to this day. When I created the character of Teddy, I modeled his diet after Chloe's. The tricks and commands Jillian teaches her little companion are the ones I taught Chloe. When readers ask why I don't use a Maltese for his character, I tell them that Chloe was simply too heavy for the tote -- too much good food, I guess. Fortunately, my neighbor had a handsome little Yorkie the entire neighborhood loves. When it came time to make my author photo, I borrowed Romeo (and his owner to care for him) for the shoot. He was such a good boy! The little fella posed for so many shots, at one point he fell asleep in my arms. My friend rewarded him for his good behavior with a peanut butter flavored chew toy which he got stuck in his fur. And so the antics of Teddy began. 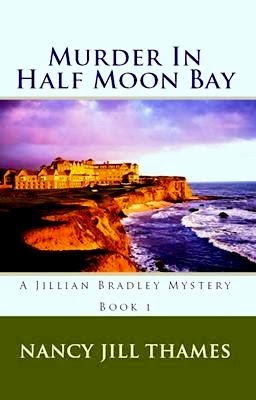 You can start following Jillian and Teddy's adventures by reading Book 1 Murder in Half Moon Bay - my free ebook gift to you.